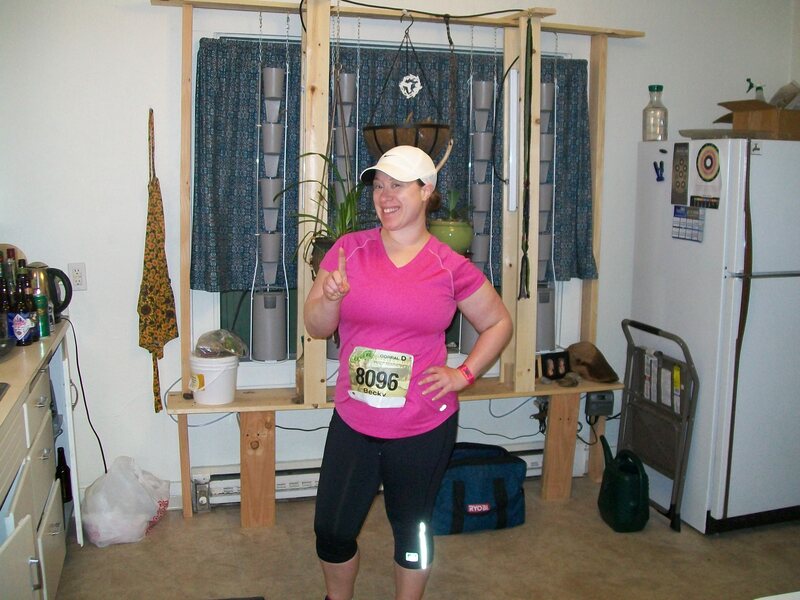 Last weekend I ran a half marathon in Eugene, Oregon, only two weeks after the Boston bombings. I’ll admit, I was feeling a little skittish about it right after all the drama happened, but as the day grew near, I could feel the support and anticipation building, and I was able to get excited again. When I drove down to Eugene and picked up my packet at the health and wellness expo, I got REALLY excited. As I noted in my last blog post, the running community is a strong one, and there are probably very few towns that are more supportive of running than Eugene, a.k.a., Tracktown USA. Last weekend, many elite athletes and hobbyists had come to this mecca to celebrate the amazing sport of running. WOW. Ladies and gentlemen, it is called Tracktown USA for a reason! The joy in this first day of the marathon event was truly palpable. There were smiles to comrades and strangers alike, hugs and excited conversations between friends. I didn’t know anyone else running the race, but I could feel the warmth of the community pulsing through the pre-race expo in waves. There were several memorials to Boston as well, and I experienced them with a somber but hopeful outlook. That evening I went to bed rip-roaringly early. I took two melatonin pills to aid in a quick sleep, and ate my carbs like a good girl—early bird style. Then I climbed into bed, ready to see the Sandman…and lay there for the next four hours. I tried everything to get to sleep. I played rain sounds on YouTube. I tried telling myself a story. I tried fantasizing. I visualized a gentle stream. Nothing worked. I would have considered asking my host to come in and tell me a bedtime story, but he had gone out for the night knowing that his guest would not want to party hard that evening. I don’t think I ever actually got any quality REM sleep, but I know I eventually closed my eyes for a short while. I wasn’t too worried; I knew there was no chance I could actually fall asleep while on the course, but I was certainly frustrated. Doing this half marathon on my own was a BIG DEAL. I had never run a race alone, much less one of this caliber. The nerves, apparently, were kicking hard. The alarm went off and I leaped out of bed. Well, I got out of bed anyway. I had pre-laid my clothes on top of my travel bag and arranged my breakfast food just-so in the refrigerator the night before, so my race preparation was flawless. There should be an Olympic category for this. I would win. I got to the shuttle parking lot right on time, and had a blessedly uneventful ride to Hayward Field on the campus of the University of Oregon. From there the start of the race was terrifyingly close at hand. I took a last minute stop at the porta-potties and got in line in my corral, a.k.a., the corral for the fast-at-heart runners, a.k.a., the turtle runners. My peeps. When corral D finally made it to the starting line, I was ready, and calm. I thanked my body in advance, queued up my watch, and prepared for greatness. 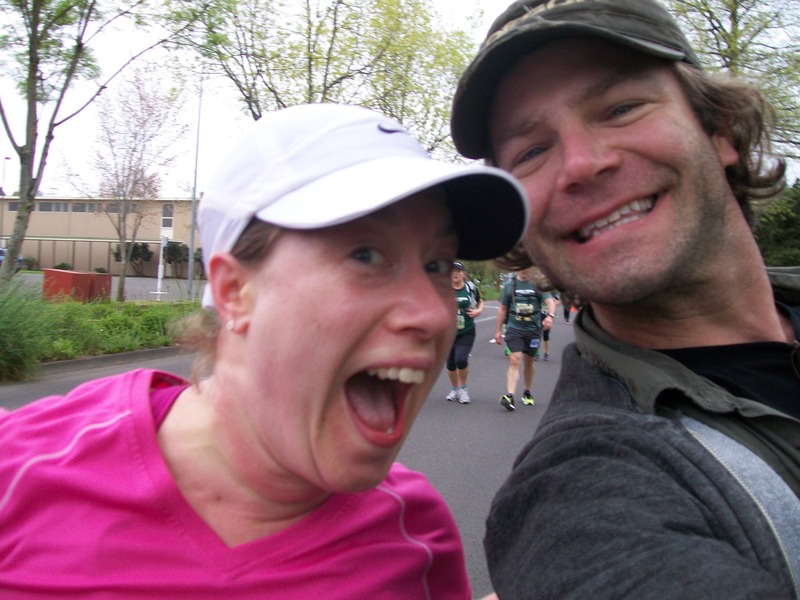 A few general notes before I describe my awesome half marathon finish: Eugene is GORGEOUS. I mean, Oregon in general is pretty amazing; we are bordered by an ocean coast, have snow-capped mountains, trees for days, and a super-cool desert too. We almost literally have it all here. Eugene really blew me away, though. I made notes to myself to come back as soon as possible for the many hiking and drinking possibilities alone, if not also to visit my host, Eric. He has always come up to Portland for visits, because, as you may know if you live in Portland, it is the sweetest place on planet Earth. I truly believe Portlandians can be a little pig-headed and snobby when it comes to our city. I am guilty of it. (That could be a topic for a whole new blog post.) In other words, I hadn’t given Eugene a fair shake. I now stand corrected. Especially if you’re a runner, you must go to Eugene for a visit or a race. The feeling of exhilaration and support was to the extreme. People from all walks of life, not just fans and family of the runners, were out cheering, waving banners, hoola-hooping, playing “Eye of the Tiger” with their 10-piece ukulele band (seriously), giving high-fives, dancing on the sidewalks in costume, and riding bikes with boom boxes attached playing upbeat songs to keep us motivated. It was unreal. I had been afraid that running 13.1 miles solo would get tedious. I had a store of monologues ready to go in my head for when I started flagging. Not once did I need to use them. All the colorful sights and music were fantastically distracting. I barely noticed I was running! In fact, the first two miles, I was so excited that when I looked at my watch I realized I was running 10 minute miles, and normally I run at a pace closer to 11:30 minute miles! In a special bonus, Eric and I realized that mile marker 6 was practically in his backyard, so he got out of bed just to meet me on the course to take pictures and run a few blocks with me. It was a priceless experience. The run ended back at Hayward Field. I ran around the track towards the big clock, and, as I used my last burst of energy to cross the finish line, I saw that there were hundreds of people in the stands. It was insane! I’ve never experienced a race where the host town and race organizers were so breathtakingly awesome. (I really wish I could find a better word here, but I really can’t.) I almost cried a few times…it was very emotional and overwhelming. I will be doing this race every year until I can no longer run. It is a standout event, and I’m SO glad I went! No words describe how PROUD I am of doing it on my own, but in my heart I knew it would be great because I could never truly be alone running side-by-side with this wonderful community of people. Surprise! Eric jumped on the course to run with me for a minute.